Today we want to share an inspiring story of a 65 years old man with you, a man, who as at the time his mates were planning how to start living on government, he had a better plan. Many people die living on pension. It is tough for the old people who have no financial support of any kind. Some have been neglected by their children. Many can no longer be employed. Some don’t have any means of livelihood, not even pension. I feel sorry seeing some old people around a premises trying to get their pension out. Well, if you are old and it seems you are tired of trying again, let this story inspire you to be who you were meant to be again. 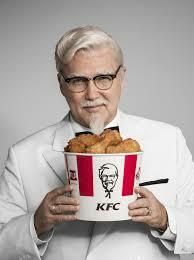 Colonel Sanders was the founder of Kentucky Fried Chicken ( KFC). His whole life before founding KFC made him look like an epitome of failure. At age 5 his Father died of fever . Sanders’ mother obtained work in a tomato cannery ,and he was required to look after and cook for his siblings . By age seven , he was skilled with bread and vegetables, and improving with meat. The children foraged for food while their mother was away for days at a time for work. When he was 10 , he began to work as a farmhand for local farmers. In 1902, Sanders’ mother remarried. Sanders had a bad relationship with his stepfather. In 1903, he dropped out of school and went to live and work on a nearby farm. At age 13 , he left home by himself. He then moved with his family to Tennessee. Sanders lost his job at Illinois after brawling with a colleague. Sanders moved again to work for the Rock Island Railroad while Josephine and the children went to live with her parents. After a while, Sanders began to practice law in Little Rock, which he did for three years, earning enough in fees for his family to move in with him. His legal career ended after a courtroom showdown with his own client. He joined the army and wasted out there. A lot of failure, you will say, but Sanders would not give up yet. He became an insurance sales man and failed again. He was fired for insubordination. He moved to Louisville and got a sales job with Mutual Benefit Life of New Jersey. In 1920,Sanders established a ferry boat on the Ohio River between Jeffersonville and Louisville. He canvassed for funding , becoming a minority shareholder himself, and was appointed secretary of the company . The ferry was an instant success. Sanders cashed in his ferry boat company shares for $22,000 and used the money to establish a company manufacturing acetylene lamps. The business failed after Delco introduced an electric lamp that they sold on credit. Sanders moved to Kentucky to work as a salesman for the Michelin Tire Company. He lost his job in 1924 when the company closed their manufacturing plant. In 1924, by chance, he met the general manager of Standard Oil of Kentucky who asked him to run a service station in Nicholasville. In 1930, the station closed as a result of the Great Depression . He became a cook and dishwasher in a small cafe. He later ran cafeterias for the government at an ordinance works in Tennessee, followed by a job as assistant cafeteria manager in Oak Ridge , Tennessee. On the 1st day of retirement he received a cheque from the government for $105. He felt that the government was saying he couldn’t provide for himself. He decided to commit suicide. It wasn’t worth living anymore; he had failed so much. He sat under a tree writing his will, but instead, he wrote what he would have accomplished with his life. He realized there was so much more that he hadn’t done. There was one thing he could do better than anyone he knew. And that was how to cook. At age 88 Colonel Sanders, founder of KFC empire was a billionaire . KFC was one of the first fast food chains to expand internationally, opening outlets in Canada and later in England , Mexico and Jamaica. By the time of Sanders death at 90 , there were an estimated 6,000 KFC outlets in 48 countries worldwide , with $2billion of sales annually. Sanders remains the official face of KFC and appears on its logo. It is never too late to be what you ought to have become. You’re not too old yet.